Microsoft offers an alternative to Clean Installing. Alternative is to use the option of Reset in your Windows 10 to turn-back your system to a fresh stage as if you freshly purchased a system. 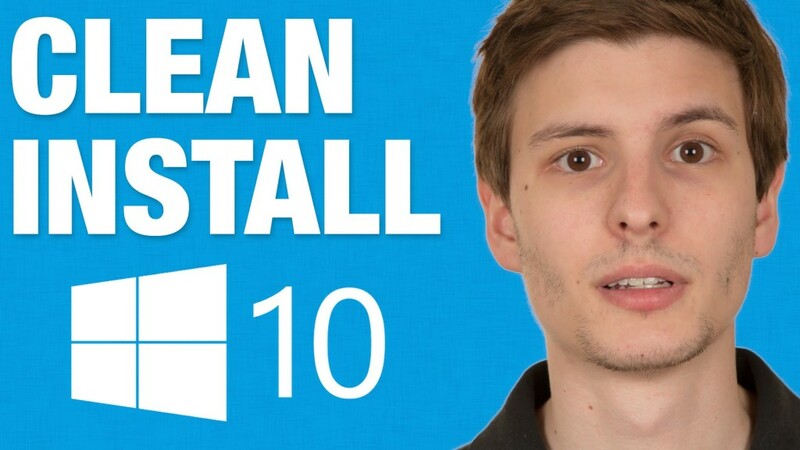 This might help you if you have installed Windows 10 by yourself. But if you have purchased a Windows system already loaded with Windows 10 and you deleted certain bloatware that annoyed you, then Reset Option may bring back the bloatware. You must be aware that this not a perfect solution to Clean Installation but is an alternative. Some of the users have reported that the Reset Option hasn’tsolved certain issues like system corruption and some other bloatware related issues.Still if you want to contine with Reset Option, you have to follow the following steps. You have to select and open Settings Application and from there you have to tap on Update & Security. There you may find the option named Recovery and from there you have to click the button named Get Started, which you will find under Reset. This option will remove your personal files too. It is advisable to have a back-up of all your files before you go for Reset Option. If you would like to do a Clean Install of Windows 10, but you haven’t performed the Windows upgrade to Windows 10 from your Windows 7 or Windows 8.1 system, then you may be required to perform some additional work. You should take the benefit of Windows 10 upgrade before you perform a Clean Installation of Windows 10. But this won’t be needed if you have purchased a system pre-loaded with Windows 10 or you have bought your own licensed version of Windows 10. During the process of upgrading from Windows 7 or 8.1 to Windows 10, the installer makes sure that your system is installed with genuine version of Windows. After going through this step only, the installer activates your system for Windows 10.This doesn’t mean that you are going to get Windows 10 Product Key, but it ensures that your system hardware is registered with servers of Microsoft. In future when you try to install Windows 10 again in that particular system, the servers recognizes the action and involuntarily initiate the process. But if you are not ready to take the benefit of this process of upgrade then this registration will not take place at all. One more thing you should understand is that, there is no other option available before you, to enter the Windows 7 or 8.1 key to Windows 10 installer, other than upgrading your system to Windows 10. You are bound to perform this provided you would like perform a Clean Installation.Upgrading your system to Windows 10 is quite simple actually. All you have to do is to download Windows 10 Media Creation tool from Microsoft and command it to Upgrade this PC now. This will upgrade your system to Windows 10 provided you are running on Windows 7 or 8.1 original version. When you are, you have to ensure that Windows 10 is being activated in advance to perform Clean Installation. You can monitor this by selecting Settings and tapping on Update & Security. Then you have to select Activation. Again you have to crosscheck for the message that says, Windows is Activated. You must not proceed with Clean Installation until Windows 10 is activated. Even if you have upgraded your system with Get Windows 10 reservation process, still you may have to download Windows Installation Media which will help you to install Windows 10 from scratch. The Windows 10 Media Creation Tool will help you to download the most apt installation files for Windows 10. It is loaded with in-built tools to make USB installation media or load installer DVD. Care must be given to handpick the most apt installation media for the correct version of Windows 10 that is either Windows 10 Home or Windows 10 Professional version. Here you have to give selection for the language and also select the variant that is either 32-bit or 64-bit. Even though the user is allowed to make installation media, the installer is designed to handpick the most apt media to install Windows 10 on your computer.User is required to install Windows 10 from installation media. Then you are required to restart your system with the help of USB Drive or DVD drive. This can be done only after changing the settings of BIOS and then get into the Boot Menu. When Windows Installer initiates the user has to select Install Now. Then you will directed to another where you will be asked to enter the Windows 10 Product Key. If you have performed free upgrade of Windows 10, then you will be having no product key. In this case you have to click on Skip Button. Otherwise just enter the product key. Now you have to pass through the usual setup process until you see Which Type of Installation Do You Want?, dialog box. There you have to opt Custom, to confirm you are continuing a Clean Installation and not an Upgrade Install.You are allowed to part your system drive as you like. It means the users are allowed to have as much as drives as theywant. When you finish the process, you will be asked to enter the Product Key. Users are allowed to bounce this part by taping on Do this later and after that they are allowed to carry on the process. Then you have to log-in to your Clean Installed Windows 10, this will involuntarily trigger itself to get connected to Internet. If you opt for upgradation then this automatically check your system’s hardware and then tally it with Microsoft and confirms whether your system hardware is programmed to run Windows 10 or not.The activation may take some time if the server is over populated. This may be solved if you have the patience to wait. Another option available is to trigger the process. This can be done by opening up the Administrator Command Prompt. This can be opened by right clicking on Start Button or by holding Windows Key + X and opting Command Prompt (Admin). You have to type slmgr.vbs/ato and the hit Enter. Still if you face with any error problems or loading problems then you have to initiate this command for several times until it is done.